Tulane campus police have arrested three people for allegedly setting the dorm room of a member of that campus’s Young Americans for Liberty on fire. The three people will be facing aggravated arson charges. Robert Money, 21, David Shelton, 20, and Naima Okami, 20, will be facing counts of aggravated arson, according to Blake Arcuri, the general counsel of the Orleans Parish Sheriff’s Office in Louisiana. It’s unclear how the police identified the three individuals. 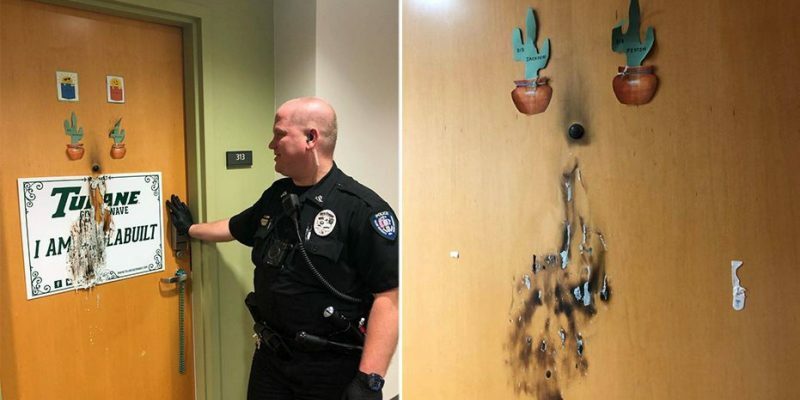 The fire reportedly happened on Saturday at 12:20 a.m., when sophomore Peyton Lofton, 20, says he received a text from his roommate and best friend, Jackson Arnold, 20, that their dorm room was on fire. Lofton was out with friends at the time. Jackson Arnold, who is the roommate of the student who as targeted, was in the dorm at the time of the fire. Thankfully, he got out with no injuries. On March 17th, a left-wing Twitter account “doxxed” Peyton Lofton as a member of Tulane’s Young Americans For Liberty chapter, which he is. Lofton is also the head of Tulane’s Turning Point USA chapter. Speaking of which, Turning Point USA President Charlie Kirk helped draw attention to the fire on Twitter. Donald Trump Jr. also helped draw attention to the case. According to Tulane University, two of the arrested are Tulane students. Meanwhile, Naima Okani attends Brown University. As for Peyton Lofton, he’s not intimidated by this attack. He plans on staying on Tulane’s campus, despite the fact his family is only 20 minutes away. He also told Fox News he plans on working twice as hard now. Recently, Tulane’s YAL chapter helped sponsor a conference on criminal justice reform. That conference drew participants from all across the political spectrum. But YAL is not the only libertarian organization in progressive crosshairs. Congresswoman Alexandria Ocasio-Cortez wrote a letter targeting the donors to Students For Liberty, another libertarian organization.